Home Tips & News Wireless cameras to keep an eye on the kids! Wireless cameras to keep an eye on the kids! 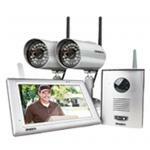 Do-It-Yourself video surveillance made easy with 3 great options. Perfect for keeping a watchful eye on things the Smanos IP6 Wireless Camera is part of our growing wireless smart home range at PB Tech. With it, you can check out a video stream right on your smartphone - and also communicate with two-way audio! The built-in microphone has advanced noise reduction capabilities and its highly sensitive omnidirectional mic and speaker combo allows for easy checking in on family members. Everything is controlled via an app available for both iOS and Android devices and with this you’ll get to see and hear what's going on quickly and whenever you want - right from your smartphone or tablet. With a sleek design which has won them multiple prestigious awards, such as Good Design, iF Design and Red Dot Design. The Beseye camera is acknowledged to be pretty wonderful for both its appearance and functions. 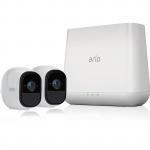 If you're looking for something that's a pretty hi-end, a very popular choice here at PB Tech is the ARLO Pro Weatherproof Dual Camera Kit from Netgear. A completely wire-free home camera system that uses a pair of cute, battery-powered cameras and a base station to help you track motion in and around your home and view live and recorded video from your smartphone or PC. This one takes home security technology even further and includes rechargeable batteries, motion and sound-activated alerts, 2-way audio and a very loud 100+ decibel siren. Great for all kinds of surveillance the ARLO kits are top quality and being rechargeable allow you to put them wherever you want to - just like C M Lynn did when they captured this great little video. "We grabbed our Arlo kitchen camera and placed it on the deck rail for added security. Such a thrill when Arlo sent us two alerts capturing this beauty so close up." Check out our massive range in CCTV and Surveillance plus all the latest options from our new Smanos Store + Netgear Store at PB Tech today!